Back in the early 1980s, when the weekly magazines here in Japan were publishing stories on the often acrimonious debate concerning the origins of the Japanese language, I remember remarking that a controversy in the British or American tabloids about anything to do with the language(s) of the Angles, Saxons, and Jutes was most unlikely. The reporting was, to be sure, marred by Nihonjinron sensationalism and bias, but at least it made linguists like me feel that our endeavors were somehow important. Then, in 1986, The Story of English appeared, an Emmy-award-winning BBC and PBS television series written by Robert McCrum, together with William Cram and Robert MacNeil. Suddenly, the history of the mother tongue had become fashionable. 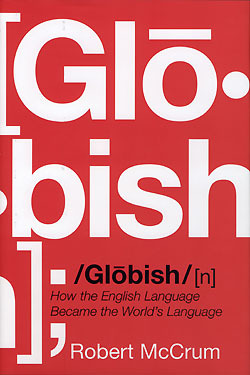 In Globish: How the English Language Became the World’s Language, Robert McCrum notes that, “[at the time] we believed we were providing a snapshot of the English language at the height of its power and influence, a reflection of the Anglo-American hegemony…The Story of English might turn out to be a last hurrah.” The next paragraph begins: “We were, of course, dead wrong.” Globish, even more than the previous work, exemplifies English-language triumphalism. In a short initial chapter, McCrum takes us on a whirlwind tour of a more than a millennium, from Tacitus’s Germania to William the Conqueror. The linguistic description is necessarily impressionistic. In the next chapter, he describes the downtrodden Saxons under Norman rule, no doubt to dramatize the remarkable reemergence of English by the fifteenth century as the language of the entire realm. By the end of part 1 (Founders), we have come to Shakespeare, the King James Bible, and the founding of the American colonies. Part 2 (Pioneers) takes us from John Adams to Barack Obama, from the War of Independence to the Gold Rush, the Gettysburg Address, and the Civil Rights movement. Although Noah Webster’s dictionary and Mark Twain’s Black English are mentioned along the way, the American language is largely lost in the shuffle. Part 5 (Globalizers) focuses on the distinct roles that China and India are playing in the expansion of Globish. “. . . [I]t is in the heart of Africa that the supranational power of English could be decisive. The continent has the vast, untapped resources of the oil and natural gas that China needs to fuel its growth.” (p. 239) For India, English, “the language of the former colonial masters” is both a unifying force in a country of immense linguistic diversity and an enormously advantageous tool in the international marketplace (p. 245). This is, to use another term from the Celtic world, pure blarney. Firstly, Anglo-Saxon poetry, which is strictly Germanic, is replete with “melancholy” and “otherness.” (C. S. Lewis, who was half-Welsh, knew very well what Morris is talking about, but he called it by its well-known German name: Sehnsucht.) Secondly, “Celtic” is, properly understood, a linguistic and cultural, not a racial, term. Swift was born in Dublin, but his parents were both solidly English. Dylan Thomas never learned Welsh and, indeed, had no use for it. Again, it should go without saying, language and culture are not genetically inherited. McCrum describes a conversation in Globish between a Spanish UN peacekeeper and an Indian soldier as “a highly simplified form of English, without grammar or structure.” (p. 8) Languages lacking grammar and structure are like non-molecular water; that is, there is no such thing. It’s a matter of elementary linguistics. For centuries Japanese was remote, mysterious and separate. But this special linguistic inheritance does seem to have made Japan proud of its culture, as it did in Britain. Paradoxically, a nation that is assertive in business and commerce is unconfident in language and culture…Ever since Commodore Perry’s appearance off the coast of Tokyo in 1853, and long before Hiroshima, there had occasionally been suggestions from leading Japanese that the country should adopt English, or even French, as the national language. Many older Japanese, Nobel laureate Kenzaburo Oe, for example, are fluent in French, and well versed in French culture, a hangover from colonial days. (pp. 221-22). This is all either misleading or just plain wrong. As those of us who live here know, the Japanese are second only to the French in taking loving care of their language. Those on the masochistic margins who have denigrated it are arguably no less enamored of it than the linguistic nationalists who have extravagantly extolled it. The first part of McCrum’s last sentence here is incorrect, and the final phrase is baffling. If McCrum focuses too much on social history at the expense of linguistic history, he also indulges in political asides that distract from his overall theme. His unabashed enthusiasm for Barack Obama and undisguised distaste for Obama’s predecessor will cause some readers to squirm, particularly now that “hope-and-change” euphoria has noticeably faded. All in all, however, Globish is a book that anyone in the language endeavor, including Globishly involved SWET members, will find a rewarding read. More than compensating for the annoying distractions are such tidbits as the fact that Anne Boleyn had “goggling, almond eyes” and that George Orwell’s widow agreed to the filming of Animal Farm in exchange for a chance to meet Clark Gable.